Lasers are just cool, and now they have been for fifty years. Hit the link for photos and a thorough Technology Review history on controlling excited photons. The previous post was a bit of skylarking on practical solar power, this post is right here on the ground about a current practical application for graphene. I have a feeling I’ve have the opportunity to do many more posts along these lines about the highly touted nanomaterial. A startup company in Jessup, MD, hopes later this year to bring to market one of the first products based on the nanomaterial graphene. Vorbeck Materials is making conductive inks based on graphene that can be used to print RFID antennas and electrical contacts for flexible displays. The company, which is banking on the low cost of the graphene inks, has an agreement with the German chemical giant BASF and last month received $5.1 million in financing from private-investment firm Stoneham Partners. Since it was first created in the lab in 2004, graphene has been hailed as a wonder material: the two-dimensional sheets of carbon atoms are the strongest material ever tested, and graphene’s electrical properties make it a potential replacement for silicon in faster computer chips. Synthesizing pristine graphene of the quality needed to make transistors, though, remains a painstaking process that, as yet, can’t be done on an industrial scale, though researchers are working on this problem. Vorbeck Materials is making what company scientific advisor Ilhan Aksay calls “defective” graphene in large quantities. Though the electrical properties of the graphene aren’t good enough to support transistors, it’s still strong and conductive. Guest blogging at Technology Review, futurist Ray Kurzweil writes about combating the aging process. Entropy is not the most fruitful perspective from which to view aging. There are varying error rates in biological information processes depending on the cell type and this is part of biology’s paradigm. We have means already of determining error-free DNA sequences even though specific cells will contain DNA errors, and we will be in a position to correct those errors that matter. The most important perspective in my view is that health, medicine, and biology is now an information technology whereas it used to be hit or miss. We not only have the (outdated) software that biology runs on (our genome) but we have the means of changing that software (our genes) in a mature individual with such technologies as RNA interference and new forms of gene therapy that do not trigger the immune system (I am a collaborator with a company that performs gene therapy outside the body, replicates the modified cell a million fold and reintroduces the cells to the body, a process that has cured a fatal disease–Pulmonary Hypertension–and is undergoing human trials). This sounds like a very promising nanotechwith practical applications. I enjoy blogging on both nanotechnology and solar energy research, but it’s always more interesting when the breakthrough are somewhere close to actual real world application. Here’s the entirety of a quick-hit post from Brad Feldat Technology Review on VC friends of his who’ve began blogging. I read VC blogs on occasion. They are interesting for a number of reasons, and they offer a lot of inside information for my privately-held clients looking for angel funds. My friends at Highway 12 Ventures have started a blog. The gang at Highway 12 is based in Boise, ID and has built a very interesting portfolio throughout the Rocky Mountain region. Plus they are great guys. Fortunately they put Lijit on their blog for search so I didn’t have to badger them about into using it and it made it easy for me to add them to the brand spanking new Venture Capital Bloggers Network powered by Lijit. Density to the tune of 10 terabits per square inch through use of a nanomaterial. The self-assembling of materials known as block copolymers could provide a low-cost, efficient way to fabricate ultra-high-density computer memory. Block copolymers, which are made of chemically different polymers linked together, can arrange themselves into arrays of nanoscale dots on surfaces, which could be used as templates for creating tiny magnetic bits that store data on hard disks. Until now, though, there was no simple, quick way to coax the block copolymer to make the desired arrays over large areas. Researchers at the University of California, Berkeley, and the University of Massachusetts Amherst have found a simple way to coat square inches of substrate with block copolymers. The highly ordered pattern formed by the copolymers could be used to create hard disks with 10 terabits squeezed into a square inch, the researchers report this week in Science. Stem cell research – free at last! Well not quite free just yet, but the day is coming and it couldn’t come too soon. Among many, many bad science policies the US suffered under Bush 43, completely wrecking stem cell research through withholding federal funds was up there. Thankfully some private and state money came through to keep the US from completely falling behind other countries in this vital medical research area, but Bush 43’s policies hurt and probably have cost American lives because of so-far-undiscovered breakthroughs related to stem cell research. I doubt this has a whole lot of utility for the home — unless you happen to live in a really, really big place — but for larger buildings the tech sounds very promising. Air-conditioning units and heating systems are examples of power-hungry equipment that regularly switches on and off in commercial buildings. When these devices are all switched on at once, power consumption spikes, and a building’s owners are left with hefty peak-demand charges on their electricity bills. A startup based in Toronto says that it has come up with a way to reduce energy use by mimicking the self-organizing behavior of bees. REGEN Energyhas developed a wireless controller that connects to the control box on a piece of building equipment and functions as a smart power switch. Once several controllers have been activated, they detect each other using a networking standard called ZigBee and begin negotiating the best times to turn equipment on and off. The devices learn the power cycles of each appliance and reconfigure them to maximize collective efficiency. The goal is to avoid everything coming on at the same time without sacrificing individual performance. The devices work through this problem using a “swarm algorithm” that coordinates activity without any single device issuing orders. Very exciting news here. A transparent plastic product with a carbon nanotube coating will be the first electronic nanotube product to hit the market. Lots of promising applications with this product. … for this new phishing attack. Sounds like it might catch the unwary. After taking a back seat for nearly two years, LinkedIn Corp. founder Reid Hoffman is reclaiming the CEO’s job and bringing in former Yahoo Inc. executive Jeff Weiner to help steer the online professional network through its next phase of growth. Hoffman’s return as chief executive, announced Wednesday, comes as a surprise, given LinkedIn’s success since he recruited Dan Nye to take over the reins of the Mountain View-based company in February 2007. With Nye at the helm, privately held LinkedIn says it has been profitable as its revenue rose tenfold and the number of people creating profiles on its Web site more than quadrupled to 33 million. The success helped LinkedIn raise $80 million in venture capital this year in a series of investments that valued the company at about $1 billion. A stocking stuffer from Technology Review for the C8H10N4O2 fan on your list. In a 2002 story on innovative biosensors, we wrote that “researchers have long hoped for ways to make cheap and long-lasting artificial antibodies.” One of the companies that, in the intervening six years, developed just such a technology was Silver Lake Research, which claims that it can produce antibodies geared to any particular molecular target. Silver Lake has introduced antibody tests that municipalities can use to assess water supplies and that commercial farms can use to look for pathogens in cattle, but the company’s first consumer product is a test for caffeine in supposedly decaf coffee and tea. Dip one of its tiny test strips into a fluid sample, and stripes on the strip will change color if the sample contains more caffeine than advertised. Haven’t blogged about the nanotech material graphene in a while. Here’s some exciting news from Technology Review. A pair of research groups, working independently, report making graphene-based transistors that work at the highest frequencies reported to date. The new transistors are a promising first step toward ultrahigh radio-frequency (RF) transistors, which could be useful for wireless communications, remote sensing, radar systems, and weapons imaging systems. Graphene, a flat sheet of carbon atoms, is a promising material for RF transistors. Typical RF transistors are made from silicon or more expensive semiconductors like indium phosphide. In graphene, for the same voltage, electrons zip around 10 times faster than in indium phosphide, or 100 times faster than in silicon. Semantic web tech news from Technology Review. Those working on the project, coordinated by the German Research Center for Artificial Intelligence (DFKI), have been toiling for three years to create software that can spot meaningful connections between the files on a computer. Nepomuk’s software is available for several computer platforms and now comes as a standard component of the K Desktop Environment (KDE), a popular graphical interface for the Linux operating system. Microsoft is putting out an emergency patch for Internet Explorer today. If you don’t have automatic update turned on and you use IE (particularly IE7) go and get the “critical” patch. Microsoft Corp. is taking the unusual step of issuing an emergency fix for a security hole in its Internet Explorer software that has exposed millions of users to having their computers taken over by hackers. The “zero-day” vulnerability, which came to light last week, allows criminals to take over victims’ machines simply by steering them to infected Web sites; users don’t have to download anything for their computers to get infected, which makes the flaw in Internet Explorer’s programming code so dangerous. Internet Explorer is the world’s most widely used Web browser. Microsoft said it plans to ship a security update, rated “critical,” for the browser on Wednesday. People with the Windows Update feature activated on their computers will get the patch automatically. Thousands of Web sites already have been compromised by criminals looking to exploit the flaw. The bad guys have loaded malicious code onto those sites that automatically infect visitors’ machines if they’re using Internet Explorer and haven’t employed a complicated series of workarounds that Microsoft has suggested. It’s been a while since I’ve blogged about a solar breakthrough. Not sure if the spate earlier this year came on the heels of a lot of concurrent research, or if everyone was just trying to announce early-versions of coming tech because oil was so high priced. If it was the latter expect little alternative fuel news since the market pressure won’t be there until oil heads back toward three figures a barrel. That might be a while. 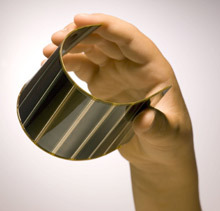 At any rate efficient thin-film solar sounds like a promising tech. It really is amazing to me the progresss going on right now in solar power. The article uses the same qualifier, but this does sound like a promising technology. Now Grätzel, along with Peng Wang, a professor at the Changchun Institute of Applied Chemistry, Chinese Academy of Sciences, have made efficient solar cells that use nonvolatile electrolytes, with the best achieving efficiencies of 10 percent. They also showed that the solar cells remained stable when exposed to light and high temperatures for 1,000 hours. The advance “pushes the technology close to over the ’10 percent hump,’ which is where a thin-film technology needs to be to be economically competitive,” says Tonio Buonassisi, a professor of mechanical engineering at MIT. One step closer to my rooftop. Organic solar cells could cut the cost of solar power by making use of inexpensive organic polymers rather than the expensive crystalline silicon used in most solar cells. What’s more, the polymers can be processed using low-cost equipment such as ink-jet printers or coating equipment employed to make photographic film, which reduces both capital and manufacturing costs compared with conventional solar-cell manufacturing. The company has produced its cells in a relatively small pilot plant with the capacity of creating about one megawatt of solar cells a year. The large gigawatt capacity of the plant was made possible by the fact that Konarka does not require specialized equipment to make its solar cells. Indeed, the factory and equipment were formerly owned by Polaroid and used to make film for medical imaging. With minor modifications, the same equipment can now be used to make solar cells. Richard Hess, Konarka’s president and CEO, says that the company’s ability to use existing equipment allows it to scale up production at one-tenth the cost compared with conventional technologies.